Air • Cache County calls the state's proposed rules a "sledgehammer approach" to a periodic problem. 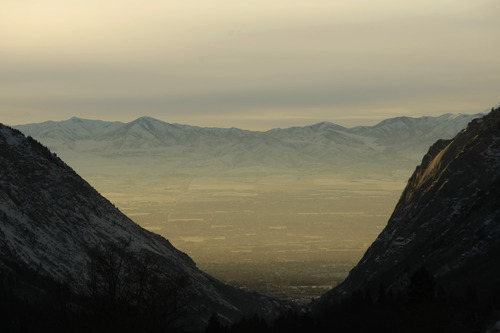 Chris Detrick | The Salt Lake Tribune An inversion in the Salt Lake Valley as seen from Little Cottonwood Canyon on Jan. 11, 2011. State regulators pressed forward Wednesday with a thick package of rules to cut winter pollution in northern Utah. With proposals to expand auto-emissions inspections, encourage public transit and cut industrial pollution, the sweeping emissions-cutting plan would impact all those living and doing business in the state's inversion-plagued urban areas. And that explains why one area  Cache County  already has balked at implementing a key regulation: requiring its residents to begin emissions-testing on cars and trucks. "The benefits are small and the costs are huge," said Craig Peterson, a Cache County councilman and member of the state Air Quality Board, which gave preliminary approval Wednesday to the package of 17 measures. Peterson cast the only two "no" votes of the day on the measures that referenced the new emissions-testing program. Now the proposals go out for public comment on Oct. 1, and public hearings are set for Oct. 15, 16 and 17. Even though the state's air-pollution experts have been working on the plan for more than two years, it still falls short of the health-based pollution standards the U.S. Environmental Protection Agency is requiring states to meet by 2014. And while harmful PM 2.5 pollution will be cut significantly, regulators continue to search for still more reductions in the microscopic soot that builds up in the basins during winter inversion periods. In Salt Lake County, another 5 percent reduction in emissions is needed even with a five-year deadline extension to 2019. New data from fast-growing Utah County shows further reductions of more than 10 percent in emissions would be needed to meet EPA limits there. With an emissions-testing program, Cache County is expected to meet the EPA standard. Dave McNeil, whose team of air-quality experts has been working on what's called the "state implementation plan" (SIP) with stakeholders all year, still called the plan a work in progress. It's due at EPA in final form in December. "These SIPs are all about protecting public health," noted McNeil, adding that the very young and the very old are most vulnerable to pollution-caused sickness. "We can't forget this is all about health." Particles of PM 2.5 pollution are about 1/40th the width of a human hair, and they embed deeply in lung tissue, causing a variety of serious health problems, including heart attacks and premature death, in addition to such annoying symptoms as stinging eyes and chest tightness. Utah, Salt Lake, Davis and Weber counties already have pollution controls in place to address PM 2.5, including emissions-testing, limits on burning wood and coal and a clamp-down on industrial pollution during high-emission periods. But tighter EPA regulations announced in 2006 mean more needs to be done now to reduce the number of "bad air" days. So part of the solution means the cleanup plan for Salt Lake County expands to include Weber, Davis and Salt Lake, along with parts of Box Elder and Tooele counties. And, while Box Elder and Tooele drivers won't face emissions-programs, industries in those counties are being asked to cut their pollution as part of the cleanup plan. McNeil pointed out that the days of focusing only on industrial polluters is over  more people in northern Utah means more cars on the road and more emissions related to heating homes and producing the goods and services they rely on. "We've identified the problem," McNeil said, "and it's us." The Cache County Council isn't buying that line of reasoning, though, and it voted down emissions testing 5-2 last month. Calling it a "sledgehammer approach,, Peterson noted that it would cost the county's vehicle owners $1 million a year at $15 a test for cars more than 4 years old. But state regulators said tailpipe emissions from the county's relatively old fleet of vehicles account for 60 percent of the pollution, and the county's sole industrial polluter  the Pepperidge Farms plant  doesn't produce enough emissions to solve the problem all on its own. Regulators plan to attend the Cache County Council meeting next week in hopes of settling on a solution. The Utah Division of Air Quality estimates that its PM 2.5 reduction proposal will cut pollution by 7.5 tons per day in Cache County, 29 tons per day in Utah County and 123 tons per day in Salt Lake County.